This is a Crozet classic! 17 miles and over 4000′ of elevation gain, this route takes you up the infamous Jarmans Gap Road, then into Shenandoah National Park with beautiful single track, mountain streams, the Appalachian Trail, and a 360-degree summit view from Turk Mountain. Start/Finish: Parking is at the bottom of the gravel portion of Jarmans Gap Road, right near Chiles Peach Orchard in Crozet (Open in Google Maps) Note: Parking is limited here – there are just a few spots on the side of the road. Turn RIGHT/NORTH on the AT. Go for 0.25 miles to the intersection with the South Fork Moormons River Rd. Turn LEFT onto Turk Branch Trail and climb for 2.5 miles (~1150 ft climb) to the Turk Gap Parking area off Skyline Drive. Turn RIGHT on Turk Mountain Trail and travel 1.0 miles to Turk Mountain Summit. Turn around, head back to the AT intersection and turn RIGHT/SOUTH on the Appalachian Trail. 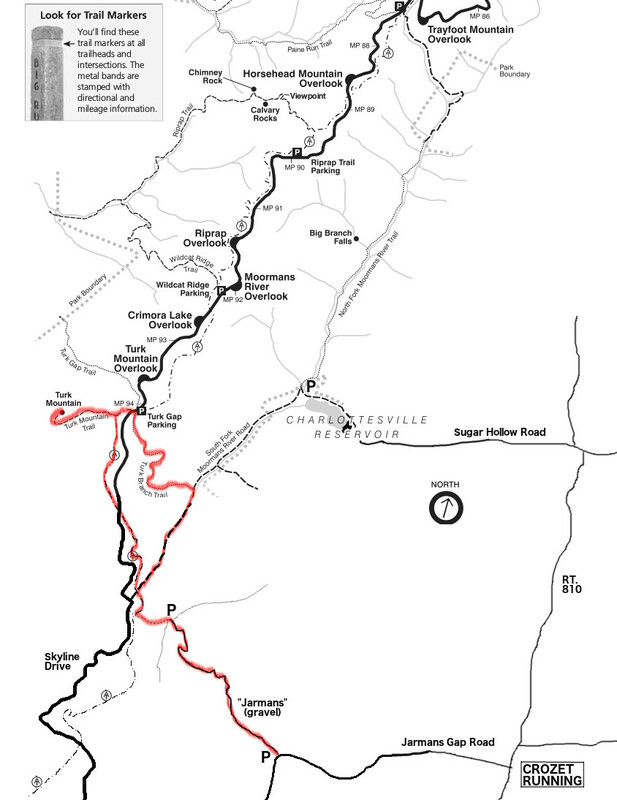 Stay on the AT for 3.6 miles to the intersection with the Jarmans dirt jeep road. Turn LEFT/Uphill to get back to the top of the gravel Jarmans Gap Road. Descend back down Jarmans to your car.